Each Parish Church has (normally) two Churchwardens, who are elected annually by a parish meeting held not later than 30 April. 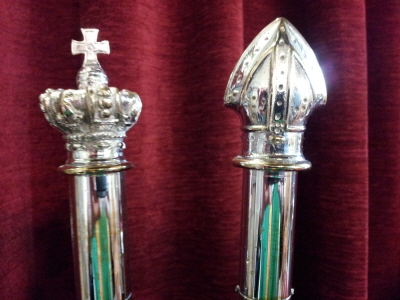 The duties and responsibilities of Churchwardens are set out in Canon E1 of the Canons of the Church of England. Section 4 of the Care of Churches and Ecclesiastical Jurisdiction Measure 1991 sets out the duties of Churchwardens as to the recording of information about churches. Section 5 sets out the duties of Churchwardens as to the church fabric and articles belonging to the church. The Registrar receives a number of enquiries each year regarding the appointment and resignation of Churchwardens. The current law relating to Churchwardens is contained in the Churchwardens Measure 2001, which replaces the Churchwardens (Appointment and Resignation) Measure 1964. The attached Notes, which compare the old law and the new, will hopefully answer most of the questions which usually arise. The Legal Office of the National Institutions of the Church of England has also produced a useful Guide to the Measure. By Mike Alexander and Jeremy Martineau. Published by Canterbury Press. Priced £5.95. ISBN 1-85311-505-3. Instructions from the Bishop of Peterborough and the Bishop of Brixworth to Rural Deans and Churchwardens. The following books will also be of interest to Churchwardens and PCCs. By Martin Dudley and Virginia Rounding. Published by SPCK and available from Church House Publishing. Price £12.99. ISBN-13: 9780281060924. Edited by Thomas Cocke. Published by Church House Publishing. Price £10.95. ISBN-13: 9780715143018. Practical advice on all aspects of churchyard management. Includes advice on memorial design and areas for cremated remains. By John Penton. Published by Church House Publishing. Price £16.95. ISBN-13: 9780715140611. A guide to meeting the requirements of the Disability Discrimination Act 1995, providing detailed information and design guidance to help meet the accessibility needs of people with disabilities. By A.D.R. Caroe and M.B. Caroe. Published by Church House Publishing. Price £9.95. ISBN-13: 9780715175828. This book, first published in 1984, contains the accumulated wisdom of the Caroe firm from a century’s experience of involvement with the great buildings of the land, especially churches. By The Council for the Care of Churches. Published by Church House Publishing. Price £6.95. ISBN-13: 9780715142509. This book provides advice on the conservation of historic bells, bellframes and fittings. It provides workable guidelines that balance the needs of conservation and bellringing practice. By Peter Jay and Bill Crawforth. ISBN-13: 978-0715175842. The aim of this book is to assist parishes in deciding whether the lighting in their church is capable of improvement and, if so, in what way. It deals with lighting design, lighting schemes, different types of light source, controls and maintenance. By John Norman and Jim Berrow. Published by Church House Publishing. Price £6.95. ISBN-13: 9780715175941. Advice on the care and repair of older organs, as well as recommendations on the use of new and second-hand organs. There are helpful sections on dealing with organ builders, finance and contracts. By Dominic Gwynn. Published by Church House Publishing. Price £8.95. ISBN-13: 9780715175927. A concise and practical guide to organ conservation issues, including the principles of good restoration practice, the rewards of care and good housekeeping, the results of neglect and bad practice, and the availability of grants. By The Council for the Care of Churches . Published by Church House Publishing. Price £9.95. ISBN-13: 9780715175972. Shows how church buildings can be adapted or extended in creative and responsible ways to allow their facilities to be more widely used and more effective in mission. Published by Church House Publishing. Price £2.50. ISBN-13: 9780715175958. Another publication from The Council for the Care of Churches, this book aims to provide guidelines and encourage good practice in dealing with the upkeep and preservation of church furnishings, textiles and vestments. To obtain a copy of this booklet, telephone 01730-264735 or email info@flaginstitute.org. See also www.flaginstitute.org. We have our own flag expert in the diocese, the Rev. John Hall, Rector of Great Addington, Little Addington, Woodford and Irthlingborough, who will be pleased to answer questions regarding the use of flags at churches. Tel: 01933 650278. Email: canon.johnhall@gmail.com. For a supplier of flags, see Flying Colours Flagmakers. Churchwardens who receive complaints about the ringing of church bells may find it helpful to read an Opinion of the Legal Advisory Commission on the subject.